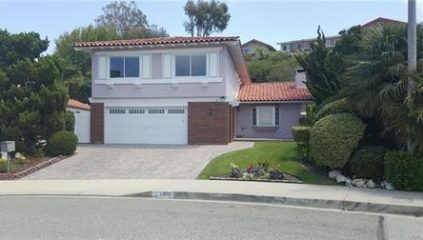 This beautiful original owner home with ocean views is surrounded by meticulous landscaping and is located in a quiet, friendly, family neighborhood. The huge front room with gabled ceiling and fireplace was used as a home office and has a built in desk, large built in drawers and cabinets, and tall built in bookshelves on three walls. A recently updated open kitchen has plenty of counter space, a built in writing desk, custom glass fronted cabinetry, and a garden window overlooking the green backyard and arbor covered patio. Adjacent to kitchen is a spacious breakfast/family room that opens into the backyard featuring well maintained and charming landscaping, a raised planter bed, and recently installed vinyl fencing. Upstairs is a huge master bedroom with en suite bath, another full bath, and three other bedrooms, two of which have ocean views. The information contained herein has been obtained from the property owner or other sources that we deem reliable. Although we have no reason to doubt its accuracy, No representation or warranty is made regarding the information, and the property is offered as is.The submission may be modified or withdrawn at any time by the property owner.